Recently, a colleague of mine asked me how soon in the school year I start working on our “indoor sound.” I hesitated for a moment because I didn’t quite understand the question. “What do you mean, our ‘indoor sound?’” I responded. In my experience, the bands that strive for their best, most characteristic “indoor” sounds are the ones that generate the most enthusiastic response from the outdoor audience and, naturally, from any judges. Back in “the day,” when drum corps played exclusively on instruments pitched in G with only two valves (or a piston and rotor! ), there was most definitely a sound associated with the activity. Many marching bands erroneously modeled their approaches based on this sound. The color, intonation, projection, and timbre of these drum corps was restricted by the equipment allowed. 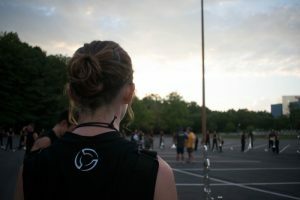 These limitations were never a part of the marching band idiom, yet the success and visibility of drum corps influenced the way marching bands approached musicianship. 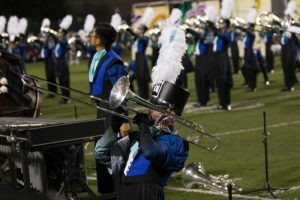 In the last 20 years, with the addition of instruments pitched in orchestral keys, drum corps have evolved more in the direction of great marching bands than great marching bands have evolved toward drum corps. Although I don’t believe there is a dedicated “indoor” or “outdoor” sound, there are undoubtedly indoor and outdoor strategies that can be employed to generate musical effect—not necessarily for artistry’s sake, but to overcome the limitations and to exploit the characteristics of an outdoor environment or a large indoor space. In addition to the venue, these strategies are also driven by another unique aspect of the pageantry arts: the brevity of the shows. One such strategy falls under the heading of “scaled effects,” such as the enumeration of dynamic levels as opposed to the traditional Italian terminology. In the marching environment, dynamics often carry numerical values (ff=Level 7, pp=Level 2, etc.) with a specific objective that involves how exposed woodwind or keyboard percussion instruments are at specific moments in the musical evolution of the production. Perhaps because the marching band contains a more diverse cross-section of musicians, this concrete approach achieves a more unified result. In addition, I believe there is a greater range of nuance available on the concert stage which necessitates a more subtle and relative approach to musicianship (how often do marching groups compete with crowd noise, traffic, and other distractions!). But I would not enumerate dynamics within the concert band setting, regardless of the skill or maturity of the individual players. Working with a concert band, I refer exclusively to the standard terminology and conventions of the orchestral idiom. Dynamics are defined as fortissimo, pianissimo, mezzo, etc. What do your kids think you value? Regardless of your approach, your students will come to value what YOU value. If you value playing loud, even if the sounds of the instruments are distorted, your kids will value that as well. They won’t know the difference. If you value playing fortissimo with a characteristic sound, one without distortion, they will strive to achieve an orchestral fortissimo (but only if you can define this for them through your pedagogy and through demonstration—that is, by playing examples of this for them). So, is there really an indoor or outdoor sound? In my opinion, there is no “indoor” or “outdoor” sound. There are strategies for achieving musical effect, but those are dictated by the environment as much as by artistic choice. If we put artistry ahead of everything, we’ll achieve a satisfying, artistic result. Of course, we have to be artists ourselves, and that demands a lifelong commitment, not a momentary competitive strategy. These and other topics will be the subject of future weekly System Blue tips. As always, if you have questions or would like more information, contact Frank Troyka at frank@systemblue.org. Despite your best efforts and your thorough preparation, some people will choose not to respond appropriately to your instruction. Off-task behavior (talking, making noise…), defensive behavior (put-downs, laughter, anger, contempt…), and refusal to participate are all behaviors you may encounter as you lead others. You are responsible ONLY for your own behavior, not the behavior of anyone else. You are TOTALLY responsible for setting a consistent, positive example and for helping to create an environment (society) that encourages right choices. Once you’ve made the decision to set the positive example—consistently and relentlessly—only then can you expect others to follow similarly. When faced with resistance from your peers, it’s easy to let your enthusiasm for getting things done turn into anger and frustration. It’s alright to be firm but not irrational or overly emotional in your delivery to reluctant learners. Do not plead, whine, nor ask for permission (“c’mon,” “ok?” “alright?” etc.). Otherwise, you admit your loss of authority and concede their control. Repeat your expectations (more than once when necessary) and wait for compliance. You send the message that the way to get attention is to respond appropriately. When you spend your energies mostly on reluctant learners, you may actually encourage cooperative participants to misbehave. Everyone wants to be acknowledged and they’ll adopt a behavior that gets attention. Move around the group, make eye contact, and call individuals by name. People respond when they hear their names and you reinforce their importance as unique members of the group. Calling people by their names is one of the most effective ways of keeping people alert and on task. Rather than separate individuals who misbehave (and draw FURTHER attention to them by doing this), consider re-setting everyone in the group. This permits you to place individuals where you can monitor their behavior and allows you to separate those who misbehave without giving them special attention. Follow the same procedures and structure as your director and the other leaders. You’re not just teaching skills to your peers, you’re teaching them how to rehearse. All members of the leadership team must follow the same procedures and use similar technical vocabulary. Consistency in your expectations, in your delivery of information, and in your actions during and away from rehearsal are the keys to efficient, effective team leadership. People are more likely to respect you when your actions and words support each other on a consistent basis. When you are unprepared to teach the material or if you run out of things to say, you lose credibility and you open the door to resentment from the group. · Memorize 5-10 key aspects of the skill you’re teaching and address them one at a time. If you’re not sure what to say, demonstrate the skill and describe how you do what you’re doing. · Relate the skills you’re teaching to previously learned skills. · Use humor to reinforce a point, not to win approval. Otherwise you are perceived as “off-task” (or worse, contrary to the other leaders and your director) and you set a poor example. Take turns being in front of the group and refer to what other leaders have said. You reinforce each other’s expertise and you can monitor behavior more effectively. · Be certain the individual is capable of demonstrating the skill successfully. Otherwise, you embarrass yourself and the individual you call upon. · Avoid creating the appearance of rewarding inappropriate behavior by having a reluctant learner demonstrate, even if his skills are high. If you sense that you are no longer making progress on a particular skill, review previously taught skills or move on to something new. Be sure to get approval from your director BEFORE introducing a new skill or concept. Never threaten nor attempt to punish one of your peers. At an appropriate time, approach your director with your concerns and allow him/her to intervene. Focus YOUR efforts on the accurate delivery of information and the consistent application of procedures. Your commitment to consistency will eventually defeat the errant wanderings of reluctant learners. If you have any questions or if you’d like to brainstorm a particular idea, contact Frank Troyka at frank@systemblue.org. We decided to feature our entire Euphonium section on Trombone for a large portion of the first production, so we went with 24. We knew if we wanted to feature other groups of Trombones later in the show, we could without having to do 24 again (which we did, featuring 16 in our 2nd production). 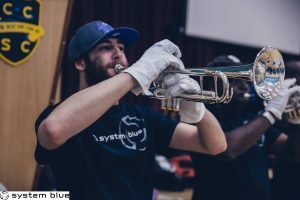 We tested 3 different Trombones at our January camp, and made the decision to go with an F attachment tenor trombone, which allowed us to do pretty much everything we wanted. W could now play in the upper register, as well as down to the low bass trombone register. At our February camp, we had most of the horns. We started listening to segments of the written show music on the trombones, figuring out HOW we wanted to feature and write for them, as well as who in our Euphonium line actually had experience on the Trombone. Surprisingly, over 1/2 the section did NOT have a lot of Trombone experience. We then knew, while we’d be OK in the end, some extra work during technique blocks would need to be spent on developing and refining the sections skills throughout the season. For us, utilizing Trombones in the show meant treating them like a specialized instrument. We didn’t want to write for them as you would a Euphonium, as we should then just play a Euphonium. So, we really took our time designing and writing around that fact musically, and looking back on it now, I LOVE how we treated that voice and can’t wait to hear those 24 musicians in the dome in Indy.